Publish and be damned. Or not. I have read many articles – some of them thoughtful and some of them witty – about why a vile front page like the Daily Mail’s proves that regulation would be useless. I have not yet read a single one that is not based on a fundamental misconception; that the freedom to publish what one chooses is tantamount to being free from responsibility for what one publishes. This isn’t true. I defend the Daily Mail’s right to splash whatever they want. This doesn’t mean it should be free from consequence. “Publish and be damned” is still the principle, isn’t it? It certainly would be the case if similarly inflamatory statements were made about an individual. The Mail would probably expect a writ to land on their desk within hours. As a result, they think more carefully about what they say when it comes to people with the resources to sue them. They try to ensure that what they say is verifiably accurate. Why should it not be the same standard when talking about entire religious faiths, ethnic groups or classes of people? Even if I accept that misrepresentation would be difficult to prove in this case, at least it would give the Mail pause for thought. The same pause for thought that they would afford a front page that concerned Peter Andre. Is it too much to ask that dead children and people who depend on benefits are afforded the same level of courtesy, rather than the “lob it in” approach? The Standards Code has not, as few appear to understand, been drafted yet. The Leveson Report makes only three broad recommendations as to its content. One of them is that the Code must cover standards of “accuracy, and the need to avoid misrepresentation”. It is vital to note that the principles proposed by the Leveson report have already been agreed – at least by the National press. The major point of contention was enforcement and whether it will be underpinned by statute or not. So, to all those journalists saying “you couldn’t possibly make provisions for this sort of behaviour”, your editors have already agreed such provisions. The only question is whether we are serious as a industry about principles of “accuracy, and the need to avoid misrepresentation”. It seems such principles are too lofty and nebulous for some, especially if properly enforced. I find that very sad. “Why should it not be the same standard when talking about entire religious faiths, ethnic groups or classes of people?” Well, quite. What the Nazi Germany propaganda machine was able to get away with – whilst magnified a thousandfold – resembles in process what’s happening here. Slag off a group or even a diffusely defined institution, and get away with verbal murder. Mind you, isn’t that the sad way of our political discourse in general? Perhaps the Daily Mail would like to balance their implications of ‘people on welfare’ by reporting again on MPs expenses. MPs had no need to “scrounge” off the taxpayer, being well paid, but it didn’t stop them. How did the DM report on that? I can’t remember. I remember seeing the screaming headline on the Daily Mail – Millie Dowler Body Found (which on closer inspection were two different stories). The Daily Mail relies heavily on emotive reporting rather than factual – for people who are unable to think for themselves. The saddest thing is that people buy it, read it, believe it. Am so glad you are saying it-you have the eloquence and intelligence to say it well. Publish and be damned is a useful motto here. The Daily Mail has published and a very large number of people have damned them for it. Saying we despise them for what they have said is not the same as saying they should be punished for saying it. Paul Dacre and A.N. Wilson are very sorry specimens who have abused their good fortune and their good education to spread nonsensical argument in calculatedly disruptive ways. They have revealed (in ways that Cameron has so far avoided) the vicious psychological core of the neoliberal personality – their contempt for the inadequacy and viciousness of some of the personal and social detritus of the version of society they are gleefully encouraging. Making a god of achievement and a virtue of accumulation per se, they are inevitably creating its murky underbelly in the form of repulsive television and luridly dishonest newspapers. 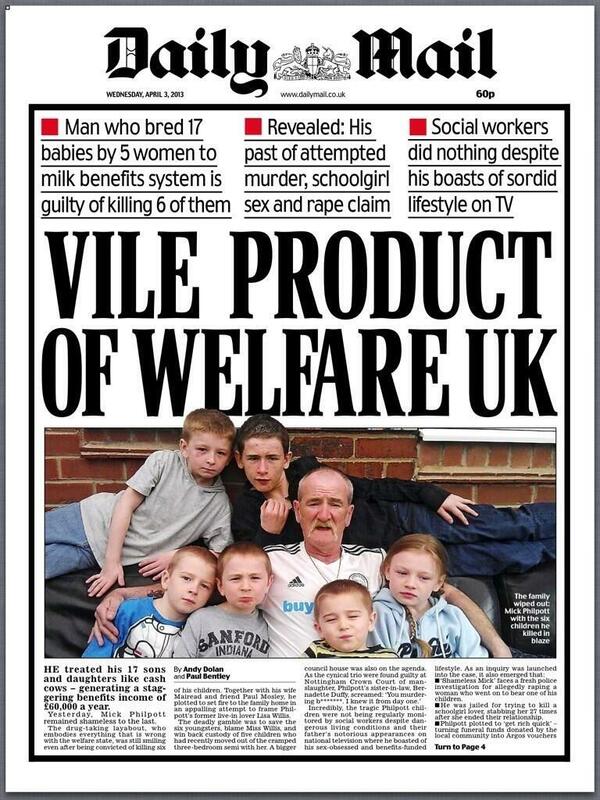 One might as well (in parallel stupidity) blame Jeremy Kyle as Welfare for infanticide. Kyle’s celebration of the man, by putting his sorry arse on TV, is no less (and no more) a cause of tragedy than specific events within a highly complex and generally effective provision of welfare. So let’s all take the opportunity to sand up and shout “VILE BIGOT!” or “REACTIONARY DETERMINIST!” at Paul Dacre for as long as we like – but let’s not get confused by arcane debates about freedom of the press.